An early version of the interior map, when Drod had crossed eyes, instead of one eye. ...there was a kickstarter. Specifically, it was the kickstarter for the second printing of my Orc Art Book (now out of print). I wasn't looking for a lot of money, just enough to cover additional costs and, perhaps, order a few more books, lowering the unit price. It went through without a hitch (aside from some medical problems that put shipping off an extra few months). 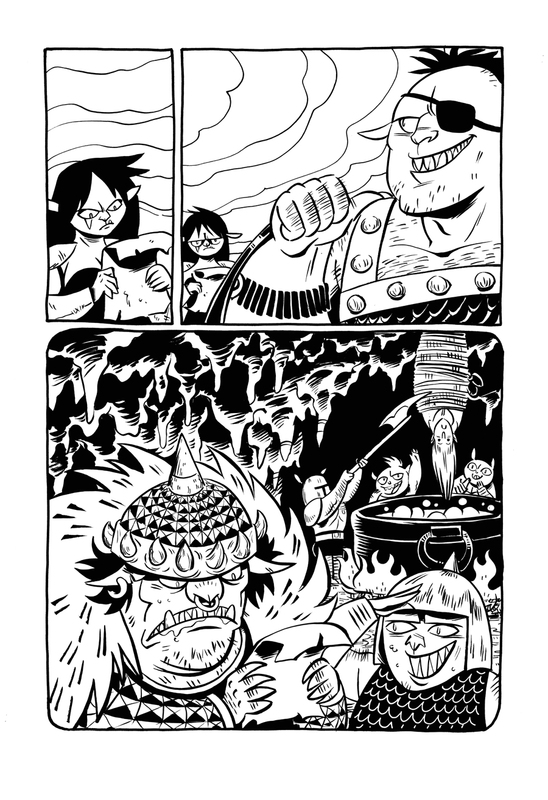 Part of that kickstarted was an option for a mini comic: 16 B&W pages of Orc fun that I was going to put together as a lark. Then I started to write. I've done many, many short comics, so the feat of doing a short story is not beyond me. But, as I was writing and building up my characters, a world started to evolve. What started out as a silly goof on Tolkien lore was becoming my own, unique world, with a map and everything. I started to really fall in love with the characters, and I started making more characters, and filling out what would become the greater Known World. 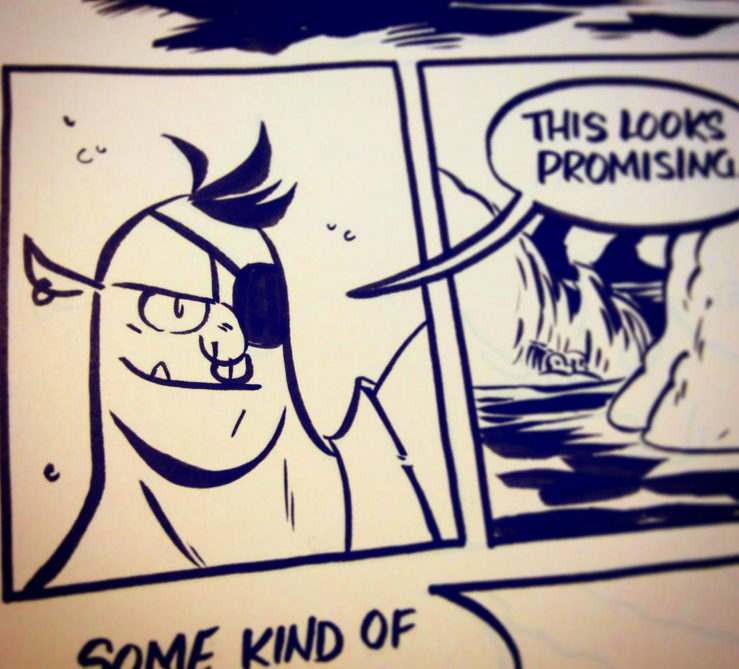 I decided to structure a larger comic, with a main story (18 pages) a "wrap around story" to add a laugh in-between and an end cap story that chronicled the adventures of Drod. As I wrote, the past had equal part to do with the future, and I wanted those timelines to become relevant to one another in future issues. Future issues. Now I was thinking of a larger story, but I knew that my main workload wouldn't allow me to make a monthly book I published on my own, so I decided to structure it like Adventure Time or Steven Universe. There was a larger timeline I was working with, but the individual stories would feed into that, so I wouldn't be leaving readers with a cliffhanger for months on end. I devoted a lot of time to character design (because I love character design), drawing the Orcs over and over. I had a good idea of their personalities, but those concepts really solidified once I had them down on paper, staring at me with their crooked, mean little Orc faces. Goodness, I loved them: Utzu and her bad attitude; Bog and his bungling; Gurh's grim stoicism; Pez's cowardice with a hint of unbridled insanity; and Zep: ninja Orc, his sister's personal nudge. Then there were the elves! I didn't think I would like Daniel and Leonard as much as I did when I first created them, but they really grew on me, and I wanted them in more stories! King Hrograhgah, I knew, would be a needed staple, but the Wise Woman came out of nowhere as one of my favorites. While they only play a small part in the first book, they really became fleshed out characters in my rough work, with stories and larger tales of their own to tell. Drod was my final creation, along with the Siren. I couldn't tell you now where Drod came from. I wanted her to be a girl, but a rough and tumble kind of girl. There's probably more of me in Drod than I'd care to admit. Minus the legendary deeds. I start all of my writing with a rough page breakdown. From there, I move to thumbnails, so I can get a sense of the page and how the dialogue will lay out. This is probably the most time consuming part of the whole process, only because I am prone to doubling back and re-thumbing pages as it becomes necessary for pacing, etc. From there, I'm on to pencils. I usually lay out text with a crappy font in this stage, so I can be sure that all of the text will fit. This is where I try to work out all of the draftsmanship, so I can pile up the inks and just ink without worrying about fixing anatomical issues. Then I ink and scan. I apply all the tones in photoshop, because buying deleter screens to tone a comic could put you into the poor house! For the cover image: because I was printing this through a low run printer, I wanted a cover that would still work if it shifted slightly, so I made for a wraparound image. It makes for an awkward composition when viewed as a whole, but it carries off as two individual images rather nicely. 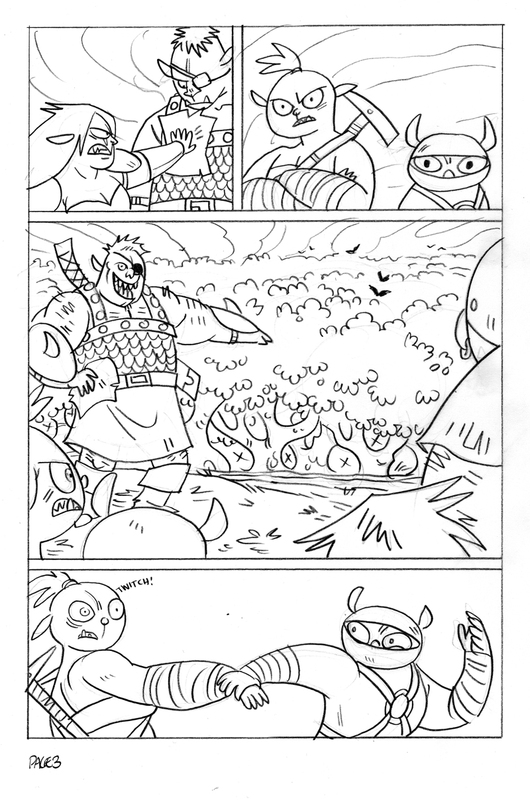 "Christine Larsen’s Orcs! is easily one of the best creator owned books that it’s been my good fortune to stumble across in a while." "Larsen definitely has a grip on what is funny." If you'd like to get a copy for yourself, you can order ORCS! in my online store, or get a digital copy off of comixology.